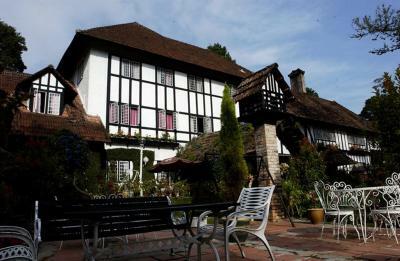 Lock in a great price for The Smokehouse Hotel & Restaurant Cameron Highlands – rated 8.2 by recent guests! The flowers are magnificent. The staffs are the best. Most helpful and lovely people. The front desk (Indian lady ...sorry can't remember her name), does the sweeping when she sees dirt on the floor. Never seen this kind of front desk will go all out to keep the areas clean without any hesitation. I really salute her. The weather is great. Overall it's a good experience. Excellent location & the awesome experience of staying in a vintage property. Beautiful gardens. Delicious food - HUGE portions! Really enjoyed drinks beside the fireplace. Beds were very comfortable, not the usual hard mattress like most hotels in Asia! Staff were very attentive, friendly and helpful. They provided us with a map and suggestions of sites to see. We bought strawberry jam and shortbread cookies from the reception counter and both very great! We were kindly upgraded to a room with a balcony. The English garden was very beautiful because of lots of colorful flowers. This hotel is close to Brinchang weekend night market. It took about 15minutes on foot. Very heavy traffic jam usually occurs, so it's a best choice to walk to there. Staffs are very friendly. Nice decoration, feel warm and enjoy the relax day here. The welcome and check in was efficient. The service was good and unobtrusive. They anticipated needs. Provided us access to the reading room. Even allowed a choice of rooms. The Smokehouse was incredible! The rooms were cozy and clean. The staff was very friendly and helpful. I could have spent all day in their beautiful English garden and exploring the main house. I highly recommend! Don’t forget to have dinner. The T-bone steak was scrumptious. The atmosphere in and around the hotel was very nice. We loved the vintage feel and the fireplace. The food was really good as well. All the staff were very nice, especially Joe and the gatekeeper who kept suggesting places for us to see. We really had a wonderful stay. 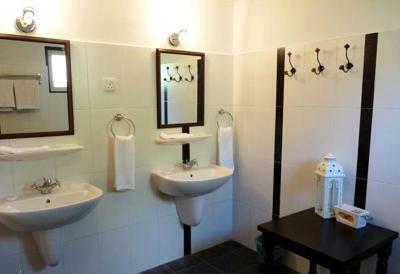 One of our top picks in Cameron Highlands.Located on the cool climate of Cameron Highlands, The Smokehouse features English cottage-style accommodations with views of its award-winning gardens or the golf course. It has a restaurant and bar. Located between the towns of Tanah Rata and Brinchang, The Smokehouse Hotel & Restaurant Cameron Highlands is a 3.5-hour drive from both Kuala Lumpur and Penang. Each suite features a blend of contemporary and traditional furnishings and comes with a spacious seating area. It comes with a canopy or a four-poster bed and tea/coffee making facilities. Private bathrooms come with toiletries and a hairdryer. Guests can enjoy traditional English breakfast at the conservatory or the hotel’s signature Beef Wellington dish in the dining room. Afternoon tea and scones are served at the garden terrace. Smokehouse provides room service and free Wi-Fi in the entire hotel. Those who drive get to enjoy free parking on the hotel premises. 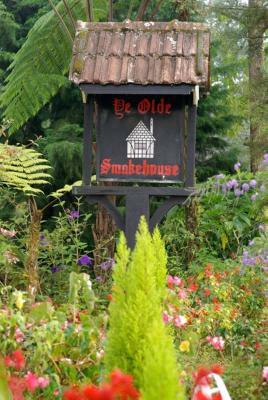 When would you like to stay at The Smokehouse Hotel & Restaurant Cameron Highlands? A spacious suite equipped with a satellite TV, a bathtub in the private bathroom and a writing desk. 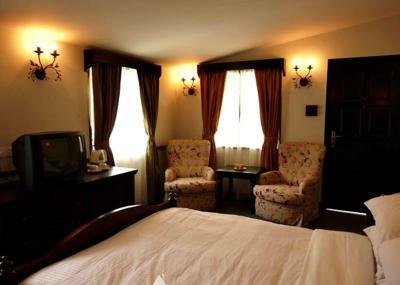 A larger suite suitable for 4 people. It comes furnished with a satellite TV, a bathtub in the private bathroom and a writing desk. A simple room equipped with a satellite TV, a bathtub in the private bathroom and a writing desk. House Rules The Smokehouse Hotel & Restaurant Cameron Highlands takes special requests – add in the next step! The Smokehouse Hotel &amp; Restaurant Cameron Highlands accepts these cards and reserves the right to temporarily hold an amount prior to arrival. The Smokehouse Hotel & Restaurant Cameron Highlands accepts these cards and reserves the right to temporarily hold an amount prior to arrival. Please note that while the hotel is very happy for guests to take pictures around the property of their stay, there will be additional charges for any wedding or professional photography sessions. Please contact the hotel directly for further details. The food was expressed as an experience 2 signature dishes Beef wellington and roast beef We had one of each between us The price is not cheap for this area nor for most countries ,so our expectations were high. Unfortunately both options failed to deliver The beef wellington pastry on the bottom was raw and the roast beef contained too much fat, The hotel itself was a far better experience. Old world feel. Staff went above what was required to make stay a pleasure. Room could do with a little makeover, especially in the bathroom. Fantastic old location with beautiful interior and gardens. Staff extremely friendly and accomodating. Beds weren’t that comfortable and our room was located so close to the main road. Breakfast, Afternoon Tea and Dinner were delicious and catered for everyone’s needs. A little gem of a find a lot of British tendencies. Gardens were stunning and in full bloom. Smell was amazing. Bathroom needs updating. Water went all over the toilet while showering. Need either a curtain or screen between shower and toilet. Breakfast not many choices. No Malaysian breakfast. Understood it's a smokehouse but it will be wonderful to have Malaysian breakfast also to promote Malaysian food. The location is great. The staff are great as well. The garden is amazing and really manage to relax in the garden. The room had smell from the septic tank. We requested to change the room and they were so courteous. Even so the smell was still there. I think the maintenance must be upgraded. We took the suite room and although there was netting, we had mosquitoes in the room. I had to come down at 4 am to get the vape mat from a staff. Just make sure the rooms have enough for guests to use. Dinner was a bit of a disappointment and very expensive ! Breakfast was very good though ! The lighting is quite bad. Need more lights though. We are vegetarian and so we didn't have much choices but to just bare with pastries and waffles for 3 days. It's not worth to include in the room rates. It's family suites but we got 2 rooms front to front (not that happy for the price). The bed is too noisy. I guess the screw is loose. Not a big deal but we were up in the hilltop suite , it could have done with a fan in the room to give moving air, with everywhere else being air conditioned these days it did feel a little airless. We liked the beautiful gardens and the old colonial style decor.